The last week has definitely been good for my ego. It is so nice to be appreciated by my peers. Especially people that I admire and appreciate so much. 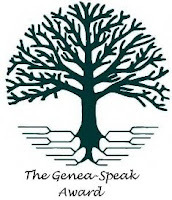 Lisa Alzo has passed me the Genea-Speak award. Thank you so much Lisa for the kind words. I'm so honored to receive it from you. It is given "for excellence in writing, speaking, and the promoting of good genealogical practices." The requirement upon receiving the award is to pass it on to at least two deserving recipients. I am going to send it on to the two people who have completely inspired me this last couple of months. Ancestry Insider and Mark Tucker. The Ancestry Insider keeps us up on two of genealogy's biggest entities Ancestry.com and FamilySearch.com. I am honored to know the identity of and be able to work with AI and it seems every time I get to talk to him I come away with a shift of paradigm. He is a brilliant person and I look forward to learning lots more from him. 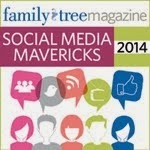 Mark Tucker from the Think Genealogy Blog is another of the great thinkers in the genealogy world. He has a wonderful graphical mind that he has used to come up with good ways to help beginners understand complex ideas. He also turned me on to the book Slideology. I look forward to learning lots more from Mark as well. 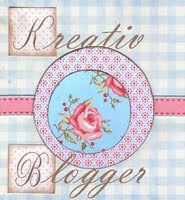 Lisa Louise Cooke and James Tanner have also both passed me the Kreative Blogger Award. I so appreciate their recognition and highly recommend their blogs to you as well. With this award, I have to reveal 7 things you may not know about me and then recommend 7 more blogs to you. 1. I "know" (read: have studied) German, Greek, Contemporary and Ancient Hebrew, Standard and Colloquial Arabic and Egyptian Hieroglyphics. 2 My favorite sandwich is cream cheese and raspberry jam, and my favorite color is purple. 3. I spent a week in the Massai Mara Game Preserve. Giraffes are absolutely beautiful in the wild. 4. 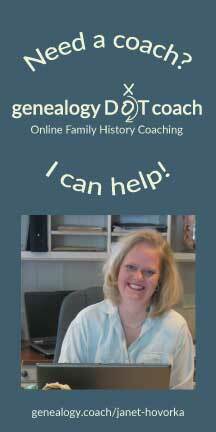 The last 5 months have totally overhauled my research methodology in genealogy. But I haven't talked about that much on my blog yet. 5. I've decided to write a book. Don't hold your breath, but I think I have something to say. You'll catch some of it here I'm sure. 6. I am going to begin teaching in the Genealogy Program at Salt Lake Community College in January. Marlo Schuldt The Heritage Collector's Blog A brand new blog by a great writer. Go check them out and tell them I said hi. You are such a honey! Thank you!